The City of Boulder is growing. With thousands of new residents relocating to Boulder each year many of Boulder’s older neighborhoods are being redeveloped to house multiple new high density uses. The east Arapahoe corridor is at the center of this movement. 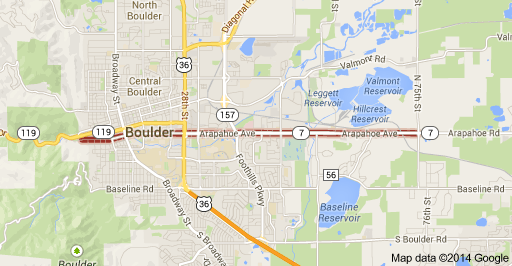 Arapahoe Street runs east and west starting at the foothills, trailing through downtown Boulder, continues east through the business district, and exits the city of Boulder at the east end into the bordering city of Lafayette Colorado. A staggering 40 percent of the workforce in Boulder works along the East Arapahoe corridor, a recent article from the Boulder Daily Camera stated. Some of the city’s largest employers are there, including the Boulder Community Hospital’s Arapahoe Campus..
Now the city is asking residents to participate in deciding how the corridor will look in the future. At a July public meeting, Boulder officials and urban planners told residents that it was important for them to have a say in the Envision East Arapahoe project, which will integrate land use concepts, transportation connectivity, and other community-led elements. Already, the Colorado Department of Transportation and RTD are taking a look at the transportation aspects of a plan for East Arapahoe. RTD is considering arterial bus rapid transit lines to the area, the article stated. Boulder Colorado residents’ comments at the meeting ranged from wanting high density rental properties to wanting greater segmentation of land planned for apartments and land planned for businesses. Some residents asked that the area be more bike and pedestrian-friendly while others asked that the roads not be widened to more than four lanes. One resident, who lives in unincorporated Boulder County stated that she wanted to see the opinions from country residents sought the same as the city residents’ opinions are. An additional public meeting is planned for October, and adoption of a final plan might happen before years’ end. Choices are a great thing. Part of Housing Helpers’ job when working with individuals and families who are planning a relocation to Boulder Colorado is listening to what their desires are and giving them multiple options that can best meet those desires. Boulder is deciding what its future is going to look like. You can too. We can help. For more information, contact us. This entry was posted in Boulder and tagged Boulder Housing Market, Boulder Real Estate, Boulder Real Estate Market, boulder relocation services on July 28, 2014 by Stephanie Iannone.